Some 2,400 years old, the Acropolis is the largest temple ever completed in Greece. 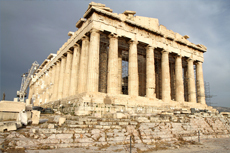 It’s a popular attraction for visitors to Athens; make sure you visit early in the morning to bypass the long lines. Booked through outside company who used Athens Limo. Booked through outside company who used Athens Limo. We did the Acropolis & New Acropolis Museum Tour. Our tour guide Dora was AMAZING!! We enjoyed seeing the Acropolis since public strikes kept us away last time. We enjoyed seeing the Acropolis since public strikes kept us away last time. Our guide had bad timing however. 10 minutes late after a break for shopping. Late again getting us to the bus. A walking tour from central RR station to Acropolis. Acropolis closed due to a pointless strike. Athens - Took the MSC trip. So many people!!!! The history is amazing, but I would recommend booking a private tour and high-tailing it here to get some time with fewer people. Very bad weather made Athens a difficult day. Very bad weather made Athens a difficult day. Heavy rain and strong wind made the trip to the Acropolis and Temple of Poseiden quite uncomfortable, but getting to see these ancient wonders were well worth the poor weather! we had rain and tough winds but still enjoyed wonderful Athens. we had rain and tough winds but still enjoyed wonderful Athens. the Acropolis is one of our favorite places to visit minus the 50 mile an hour winds. We had a half day private tour booked with AthensToursGreece and thoroughly enjoyed it. Went early, not too hot, very crowded per usual. Went early, not too hot, very crowded per usual. Definitely worth seeing. Pressure to shop in stores after. Don&apos;t like all the shopping focus and feel the guides get kickbacks from some stores. This is by far the best part of Athens. This is by far the best part of Athens. If you like ancient ruins and history this is a must. You can see all of Athens from this point. Absolutely a must. Climb up to the Acropolis is difficult and the worn rock makes walking difficult in areas. the description of this tour underestimated the number of steps to reach the Acropolis by a factor of two. The guide was informative and answered any questions with useful information. Wanted to see Museum but not included. Wanted to see Museum but not included. Guide good but a bit rushed! Very interesting and informative. The tour also took in a drive round the city. We left on the earliest one at 08.00. Better as the Acropolis gets really crowded and hot later in the day. The tour guide here was very good; very knowledgeable and seemed a genuine nice person. The tour guide here was very good; very knowledgeable and seemed a genuine nice person. Athens is Athens, it oozes history and everyone should experience it. Fantastic day. Our tour was "Acropolis and Leisure". Best of Athens and its scenic coast.